"MSB" redirects here. For information about the Nintendo DS game titled Mario Slam Basketball in British English, see Mario Hoops 3-on-3. Mario Superstar Baseball is a Mario sport title for the Nintendo GameCube and is the first installment of the Mario Baseball series, being the first dedicated baseball game in the Mario franchise. As with most Mario Sports titles, it has traditional rules of the sport, but with special, Mario-themed quirks and mechanics to differentiate itself from the real sport. This includes characters using Star Skill abilities to cause the ball behavior to behave differently; team captain's Star Skill abilities are unique and cause a wide variety of special effects such as attacking outfielders if batting and causing the pitched ball to behave erratically. Characters also have field abilities to differentiate themselves from other teammates. Chemistry is a feature unique to the Mario Baseball games where players perform differently whether they are neutral, like, or dislike another character they are cooperating with. Additionally, most fields in the game have stage hazards that can affect outfielders such as the Piranha Plants serving as obstacles in Yoshi Park. 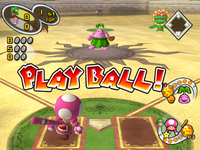 Aside from the main Exhibition mode, where players can play baseball freely with up to two players, players can participate in a single-player oriented Challenge mode that has them playing as a designated team captain and their preset team and recruiting other captains and team players to face off against Bowser. This game also introduces the Toy Field mode where individual characters play on an interactive baseball field and get coins based on where the ball lands. Finally, players can play in Mario-themed minigames that have baseball mechanics, such as hitting Bob-ombs to create fireworks or collecting gems in the baseball diamond while avoiding a Chain Chomp. Toy Field and Minigames mode are the only modes that can support up to four players. 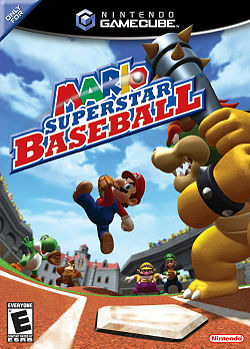 Mario Superstar Baseball plays similarly to actual baseball; teams take turn batting to run on the bases and fielding. The team who bats hits the ball to the field while the fielders attempt to make the batters out. Once a runner touches the home base, their team earns a point. There are three outs on an inning for the batting team. Once a team gets three outs, they switch sides. Whichever team obtains the most points wins. Teams, led by specific team captains, can have up to nine members. Controls for batters and runners. Selecting characters for Exhibition Mode. The start of a game in Exhibition Mode. Exhibition mode is a standard one or two player game of baseball. Players fill out a roster and play a game. There are six different, unique stadiums in which players can choose to play in. The player, before playing in a stadium, can adjust options such as number of innings, mercy, which player bats first, and turning Star Skills on and off. Players can also adjust field settings, running, drop spots, and batting cursors. Mario, using his Fireball as a Star Skill. A new feature in this game is the ability to use a Star Skill. Star Skills can be activated either while pitching or while batting. Anyone in this game can use a Star Skill, but a team captain's Star Skill is superior to a sub-character's Star Skill. Team Captains have mostly different Star Skills, however, captains that usually pair with each other (Mario and Luigi, Peach and Daisy) have similar Star Skills. The amount of Star Skills that can be used is represented by 5 Team Stars in a meter. The amount of starting Team Stars depend on the sub-characters' chemistry with the team captain. Star Skills can be replenished by hitting ball park features. They can also be replenished by striking a player out or making a batter reach a base safely when the words, "Star Chance!" appear. Team captains and sub-characters use up one Team Star while captains as members use up two Team Stars. Challenge mode (the main game mode of Mario Superstar Baseball) is a game mode where one player selects one of five Team Captains (Mario, Peach, Donkey Kong, Wario, and Yoshi) and plays with a pre-made team. The player wanders a map of the Mushroom Kingdom and can play minigames to earn coins and spend at a Shop, where power-ups can be bought. The player's objective is to beat the other four captains in a game of baseball, on their own course. In order to get the others, the player should see the scout flags for the match. Scout flags are earned by completing scout missions, such as getting a hit, or scoring a run. If the scout mission is not completed, you will not earn the scout flag(s). There are scout flags next to the characters' faces. These flags serve as a purpose for recruiting other characters to the player's team. Each character has a set number of Scout Flags (up to five flags), with team captains requiring more Scout Flags (3 on the Mushroom level, 4 on the Flower level and Star level, and 5 on the Special level) and sub-captains and characters of race (excluding the characters with color changes) needing the median number (2 on Mushroom and on Flower, 3 on Star, and 4 on Special) and minor characters needing the least (1 on Mushroom, 2 on Flower and Star, and 3 on Special). The only exception is Donkey Kong's team, with all his teammates needing only one scout flag on the mushroom level. Bowser's team cannot be recruited due to no scout flags; the only way to do so is when Bowser is selected as a challenge mode captain. When Bowser is chosen, the team players require the same number of flags as the captain when he is not chosen. Before the match, the opposing team's has the message "Round up Players" on their batting order screen. The order of the opposing team is random as well as the fielding position, with the exception of Bowser's team, whose batting order and fielding positions remain the same. Players from other teams can be recruited after clearing certain missions. When the player recruits the captain they are not able to recruit other characters on their team unless the player faces Bowser Jr.
After beating all four opponents, the path to Bowser's Castle opens, where the player is able to challenge Bowser's team. Once Bowser's team is defeated, Challenge Mode is cleared. Additionally, Bowser Jr. wanders the map. Coming in contact with him starts a short, one inning game where the player is put in various situations. If the player has had a captain join their team, they can unlock characters on their team from Bowser Jr. Sometimes, they are ahead by a point and must defend their position. Other times, they are behind and must make a comeback. Challenge Mode is the only way to unlock characters. There are four difficulties to Challenge Mode: Mushroom, Flower, Star, and Special. Once Special mode is cleared, Bowser becomes a playable captain. In Bowser mode, Bowser must beat the other five captains, and then play a team of nine of the ten captains and sub-captains, led by Mario (the excluded character is random). Bowser can recruit other characters, excluding the captains and sub-captains, and in Bowser mode, Bowser Jr. does not wander the map. Sanshin O Tore! Get a Strikeout! Hitto O Ute! Strike a Hit! In order for players to star characters, they must complete specific Star Missions for a character in Challenge Mode. These are optional, but Superstar characters have an increase in stats. The number of Star Missions vary depending on the character; generally, team captains have more Star Missions than team players. Characters have a star title: these change when characters achieve more missions. In addition, challenges are confined to specific difficulties: some challenges are exclusive to Mushroom difficulty while others can be obtained if players cleared it in Star difficulty. "Everyone's favorite hero. When Peach is in trouble, he always saves the day! A kart racer, tennis player, golf enthusiast, doctor...the list goes on and on, showing that he's a jack-of-all-trades. His trademark fireball will help him in his first foray into baseball." "The younger Mario bro. He's a better jumper than Mario but lacks good traction. Always in Mario's shadow, Luigi tends to be low-key but is always a dark horse in athletic contests. Despite perpetually finishing second, his excellent form and green Fireball make him a force." "Sarasaland's princess. Mario rescued Daisy from the nasty villain Tatanga. While often compared to Peach, Daisy is both stronger and more tomboyish than her blonde counterpart. She uses a Flower Ball that scatters confusing petals." "A dinosaur that spits eggs from her huge mouth. Birdo is very particular when it comes to fashion, though her reliance on the color pink is a bit limiting. Her bow and ring are her pride and joy. Birdo's mouth has massive suction that can even catch a ball by sucking it in." "The Mushroom Kingdom's princess. Mario has come to her rescue every time she's been kidnapped...which has happened no less than 10 times! Some speculate that an all-Toad security force may be the problem... She joins the game with a Heart Ball as her weapon." "Luigi's eccentric rival. Waluigi is a hardworking player who has been training night and day to gain enough power to best Luigi. The eggplant that his Liar Ball delivers is said to have the power to make those who touch it lose their lunches." "A denizen of Yoshi's Island. Mario's dependable buddy always helps him out of jams. Yoshis use their tongues to eat anything and everything. It is said that Yoshis can turn anything they swallow into eggs. On the diamond Yoshi's fast legs and accurate tongue make him a great fielder." "DK’s partner and buddy. Diddy’s trademark is his red baseball hat. While Donkey Kong boasts incredible power, Diddy’s forte is his nimbleness. Using his prehensile tail to great effect, Diddy Kong is a natural fielder who won’t ever boot routine balls." "According to Wario, he's both Mario's rival and a childhood friend (this is unconfirmed). He actually runs his own video-game company and has produced many hot sellers. Garlic is Wario's favorite food. It may lead to his incredible stamina, which makes him excellent at daring plays." "A gorilla known for raw power, DK lives a carefree jungle life... unless someone messes with his bananas, in which case he just loses it. His ancestor, the original Donkey Kong, wore no necktie. His talents lead in beating on primate foes and kart-racing. Fear his Banana Ball!" "Mario's arch rival and the king of the Koopa Clan. He's challenged Mario and his friends to battles countless times, but his ambitions tend to get crushed every time. His lethal Killer Ball is powerful enough to drag anyone who catches it across the field!" "Bowser's exuberant son. Bowser lied to him and convinced Jr. that Peach was his mom, resulting in a chaotic adventure for Mario and company. Bowser thinks the Koopa clan is in good hands with his son. He's not just powerful but also surprisingly skilled." "Princess Peach's subject. Though he tries to protect the princess from the evil Bowser, she gets kidnapped with disturbing regularity. There are many Toads who look just alike, and though they are generally small and look cute, they are actually quite powerful." "A familiar face of the Mario series, this member of the Koopa clan can pull his feet inside his shell to protect himself. Long ago, he didn't even walk upright, but now he's even playing baseball! Though he can do just about everything, he's slow because...well, you know." "A charming, masked soldier. Shy Guys used to serve an evil king named Wart, but they nowadays make a lot of cameo appearances as friendly rivals of Mario. That said, they aren't always good... On the baseball mound, Shy Guys are consistent players with a few weaknesses." "Though Goombas once lived in peace in the Mushroom Kingdom, they betrayed their homeland to side with Bowser. Exactly how Goomba uses his baseball gear is a bit of a mystery. Maybe you can spot the secret technique if you watch closely as he makes plays in the field..."
"Princess Peach's attendant. Though he says his life gets shorter every time Princess Peach gets abducted, he is always in good health and full of energy. While he lacks in stamina, he makes up for it by making cool plays that take advantage of his long life's worth of experience." "A resident magician of the Koopa clan. The best of the Magikoopas, Kamek, once attempted to abduct the baby Mario Brothers, but Yoshi and Baby Mario thwarted his sinister plans. The magical powers of the Magikoopa also comes in handy in the game of baseball." "A bony underling of Bowser. Some mysterious power binds the skeletal bodies of Dry Bones together, but they shatter to pieces when they take damage. Of course, over time, they go right back to the way they were without ill effect. Dry Bones throws cursed balls when he pitches." "Bowser's underling ghost. Behind the scary face lies a very shy soul. Look most Boos in the eyes and they'll cover their faces...but turn around and they'll attack you! Boos confuse their enemies by flickering in and out of the visible realm, appearing at inconvenient times." "Another longtime underling of Bowser. Paratroopa flies through the sky and delivers body checks to Mario and others, but he's vulnerable to a good stomping, which takes away his wings and turns him into a garden-variety Koopa. His wings allow him to leap up and make great catches." "Diddy Kong's partner and girlfriend. Her trademark golden ponytail is familiar to monkey fans everywhere. Dixie Kong is just as adventurous as both Diddy Kong and Donkey Kong. Combining great techniques with fast legs, she is a very dependable player." "The elder of the baby Mario brothers. After arriving in a stork-related calamity, he and Yoshi rescued his little bro. Though he's supposed to be in his youth, you can play them both at the same time for some reason. He has excellent foot speed but lacks power due to his diminutive size." "The younger of the baby Mario brothers. After being abducted by Kamek, he was rescued by Yoshi and Baby Mario. If you see him and Luigi in the same game, try to ignore the temporal paradox. Baby Luigi is quick around the bases but doesn't hit for power. He is, after all, a baby." "A mysterious member of a clan living on the southern paradise of Delfino Island. Nokis evolved from shellfish, and their ancestors are believed to have lived in the sea. While they are skillful and fast runners, they are hampered by a lack of power." "A Goomba with wings. Just like Koopa Paratroopa, Paragoombas lose their wings and turn into Goombas if they get stepped on. The Goomba family is made up of expert bunters, although no one really makes a big deal about it. Bunting, after all, isn't all that glamorous." "A lively, sometimes surly mole who lives underground and leaps out whenever someone approaches his den. He usually keeps to himself but always gets fired up for a good baseball game. In fact, when he gets the ball, he almost gets TOO fired up." "A cute Toad girl with plaited locks. Though her profile is relatively unknown, she is definitely a cheery, upbeat girl who's full of energy. Taking advantage of her fast legs and light weight, Toadette can make all sorts of difficult plays look completely routine." "The king of the Boos. The golden crown is his trademark, and while he looks similar to other Boos, it's obvious that he's much larger than the others. Not only is he powerful, but he's also a fast runner that gets his speed by hovering over the base paths." "A mutation created this boss of the Piranha Plants. Petey can fly in the air for a short while, flapping the leaves that he has developed into primitive arms. When Petey spits a ball out of his toothy mouth, it is lightning-fast." "A cheerful islander living on the southern paradise called Delfino Island. Piantas are said to be born on the mountains and they are distinguished by the palm tree growing from their heads. Their power makes them flashy, but they're clumsy and slow runners." "One of Mario's oldest and most annoying foes. The Hammer Bro is said to be the mightiest warrior of Bowser's army. Besides the hammer-throwing variety, there are also Boomerang and Fire Bros as well. Teams fear his aggressive play and lethal bat." An asterisk (*) means that character is unlockable. This is a list of teams formed by team captains in Exhibition Mode. One of them is a common team formed by a captain as the teammates is mostly a different character type than the captain's, another one must be formed by using the majority of the captain's character type, and two of them must be formed by putting in the four required characters in the captain's team. The only exception is Bowser, who needs only three required characters to play on one of his teams. Bolded names indicate that the team name returns in Mario Super Sluggers. Mario having good Chemistry with Luigi. Chemistry is a unique feature to Mario Superstar Baseball and its follow-up. Player chemistry emphasizes the relationships between characters. When forming a team, the relationship status between the captain and their teammates affects the number of power stars the team starts with. Additionally, in the game, good chemistry occurs with two friends. When a player throws a ball to their "buddy", the ball travels faster than a normal throw would. Additionally, a player hits better when one of their friends are on base. Examples are Mario and Luigi, Diddy Kong and Dixie Kong. Good chemistry is symbolized by a musical note. Bad chemistry occurs conversely. When a character throws a ball to a character they dislike, the ball travels more slowly and is sometimes out of line. Bad chemistry is symbolized when a small zigzag line appears next to the players. Examples of bad chemistry include Mario and Bowser, Luigi and King Boo. However, bad chemistry only occurs when the characters are fielding, and it does not happen all the time. The shop in Challenge Mode. These items can only be bought at the shop in Challenge Mode. 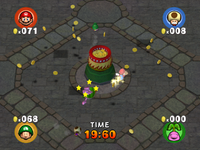 Coins are obtained for purchasing items by either defeating Bowser Jr. roaming across the map or winning minigames at the stadiums. The following items last for one game of baseball. Nice Bat - Lets the player's character get hits more easily. Power Bat - Increases the power of the character's swings. Super Ball - Increases the speed of the character's pitches. Lucky Glove - Increases the Fielding ability of the characters. Dash Spikes - Makes the characters move faster. Buddy Emblem - Increases friendship between the team. Normally incompatible characters will become more friendly to their rivals. Superstar - Increases all stats and boosts friendship. Not available until every other item has been purchased at least once over the course of multiple Challenge Mode playthroughs. Once these items are purchased, they never need to be bought again. All of them cost 200 coins and they all do the same thing: give a character the ability to use their special hits and pitches. The difference is that each one powers up just one captain. They become active when the compatible character is on the team. Jr. Mask – Bowser Jr.
One permanent item that does not give a character Special Moves is the Secret Map, which allows access to the Toy Field from Challenge Mode's overworld, therefore letting coins earned in Toy Field carry over to Challenge Mode. The Secret Map only appears if the player has beaten every minigame on the Challenge Mode overworld. Bob-omb Derby A stadium belonging to Mario in a sun-drenched beachside area. There are no features in this stadium, so this stadium is well suited for pure baseball. Wall Ball A courtyard ball park just outside Peach's Castle. Blocks float high above the fielders in this ball park. When a fly ball hits one of these blocks the ball will bounce and fly to a random direction. Brick Blocks can be destroyed while Note Blocks can't be destroyed. Blocks also give out Star Skills when hit. Chain Chomp Sprint A ball park owned by Wario in a middle of a desert. Chain Chomps guard the extreme right and left fields where the ball is fouled when landed upon there. Chain Chomps will attempt to bite the ball and they can hit characters if there is any contact. Sandstorm generators also float and make the balls change direction where it will land by generating whirlwinds. Star shaped dunes can be found in the sand and they will give a Star Skill when a ball rolls into it. Piranha Panic A scenic ball park owned by Yoshi. Piranha Plants grow widespread across the field and attack anyone who goes near a stray ball. Yellow Piranha Plants do not harm players and they give out a Star Skill when hit. Barrel Batter A stadium set in a jungle, owned by Donkey Kong. Barrels get launched from a cannon and hit any player they touch. Klaptraps are also found in a stream and they will bite a player who comes too close. When hit with a ball, Klaptraps give out a Star Skill. Star Dash A ball park inside Bowser's castle. Flying fireballs are found in chain link lava picts and they harm anyone who touches it. Thwomps also crash down to stop any would-be home run balls. Star panels give out Star Skills when they get touched in this stadium. The player must complete challenge mode once to unlock Bowser Castle. Toy Field is a mode up to four players can participate in a special field. Players take turns hitting pitched balls into a field made up of many spaces. Players earn coins depending on where the ball has landed. The player with the most coins win. Items can be used to either help or deter a player's progress depending if the ball landed on a ? area. Players can also get coins by striking a player out or catching a fly ball. Minigames are extra games outside of playing regular baseball. They usually feature baseball rules, but with a tweak added to it. Unlike exhibition, up to fours players can participate and players choose single characters instead of constructing a team. All minigames correspond to a stadium, such as Bob-omb Derby to Mario Stadium. Four difficulties are involved, though only one is available in the start for all minigames from easiest to hardest: Mushroom, Flower, Star, and Special. Flower and Star difficulties are simply harder than Mushroom, but Special usually has a tweak to it: players who play Special difficulty sets records if they beat the standard high score of the minigame. When players beat Star difficulty for all minigames, they unlock Grand Prix Mode. Grand Prix mode is basically a collection of all minigames in this order, in Special difficulty: Bob-omb Derby, Wall Ball, Chain Chomp Sprint, Piranha Panic, Barrel Batter, and Star Dash. When completed, the player will earn a Grand Prix medal, which is stored in the Records mode. This mode allows players to master and practice the basics of Mario Superstar Baseball, including batting, pitching, fielding, and base running. The player can also go here to practice against a CPU with any character they choose. Options in the Practice mode include: Batting, Pitching, Baserunning, and Fielding, where the player is given instructions on the category, playing as Mario. The last option, Free Play, is where the player can practice the four ways of playing baseball with any character they wish and as long as they want. The records for past MVPs. The options allow the player to modify game settings. Settings include turning on and off music, setting the sound scheme (Mono, Stereo, and Surround), and turning the Controller's Rumble Feature on or off. For this subject's image gallery, see Gallery:Mario Superstar Baseball. Overall, Mario Superstar Baseball was well received by critics, gaining 8.0 out of 10 from GameSpot. A GameDaily reviewer praised the game, as telling that he "found it to grow on him." IGN praised the game, but also said that "these high production values are not consistent throughout the experience." 1UP 7.5/10 Superstar Baseball was obviously meant to be played in short bursts instead of long sessions. (The lack of any sort of regular season mode ensures this.) And as this simple type of game that's neither too deep nor too shallow, Superstar's "swing at anything, steal all the time, watch out for the Thwomps in right field" brand of baseball is tough to beat. It might not be the World Series, but it's a definite wild card. Gamespy 4/5 As a multiplayer game, Mario Superstar Baseball is pretty excellent. Up to four players can participate in straight up baseball games, the various mini-games, and an interesting Toy Field mode (which is really just a bigger mini-game that's given its own menu option). While the regular baseball games are great whether you're going solo or playing with your buddies, the mini-games are exponentially more entertaining with friends. With a great main game and lots of fun mini-games, I'd go as far as to say that this is a much better party game than the last few Mario Party releases. IGN 7.9/10 Mario Superstar Baseball is far from the perfect baseball game, but it is nevertheless a fun, Nintendo-style take on America's favorite pastime so long as you understand what you're getting when you open the box...Although the gameplay experience is occasionally limited by a lack of features or cramped running/fielding configurations, the end result is still arcadey fun. Recommended for die-hard Nintendo fans and for gamers looking for a simplified, yet quickened take on the sport of baseball. "Hey, Donkey Kong! I see your team is ready. Quite a fine group of players you have there! ...Wait... Donkey Kong! What in the... What's the deal with that boxing glove? You're using that as a bat?! Is that even allowed? Ummm... Well, OK, I guess... Here's the deal. Bowser craves a test of his might. He wishes to play a powerful team. Let me give you some details, OK?" "Hi there, Yoshi! Is your team ready? Hmmmm... Looks like a very quick-footed group. Bowser craves a test of his might. He wishes to play a powerful team. So, you'd better listen to some details. OK, Yoshi?" "That's my Mario...I had forgotten how safe I feel when I'm with you, Mario! Do you think it would be all right...if I joined your team, Mario? I can? Really?! Oh thank you! May the mushrooms bless you!" "Aargh! Mario! You musta cheated last game, but not THIS time. Chump! I'm the only one in this entire kingdom with any class whatsoever! This time, I mean business! Go time! It is ON!" "YAAAAAAAAAARGH! You stink! But...you know what? I'm just gonna let it go. Yeah. I'm above holding grudges. I'll even lend you a hand! Admit it, you wanted me with you anyway! Wah ha ha ha ha ha ha! With me on board, victory is totally guaranteed! Heh heh heh heh... Idiot... That team will be all MINE someday... Hmm? What? Er... Nah, I didn't say anything! You're hearing things!" Mario Superstar Baseball was originally known as only Mario Baseball and had a different logo from the final one and the star chances were not the same as they were in the final game as well. Super Mario Bros.: The loading screen can show an 8-bit Mario hitting a ? Block or an 8-bit Mario being created and walking to the right. Also, a cover version of the overworld can be heard in Peach Garden. Mario Kart: Double Dash!! : Some of the voice clips are reused from this game. Itadaki Street DS: Mario Stadium is a map in this game. Mario Super Sluggers: This installment for the Wii console is the follow-up to Mario Superstar Baseball; the gameplay mechanics are based off of this game. This page was last edited on April 19, 2019, at 20:18.